Born on December 22, 1818, he was baptized with the name of John, and was born on the family farm in Germany. He was the ninth son in a peasant family. From an early child, St. Conrad gave indications of his future sanctity by his modesty and love of solitude. His devotion was noticeable especially when he prayed in the Church. The Church was a long way off, and he visited often, even in inclement weather. He was especially close to the Blessed Virgin, and daily recited the Rosary. On feast days, he would make long, remote journeys to a Shrine of the Blessed Mother. He would return late at night on foot, and still fasting. He lost his mother at the age of 14, and spent his time helping on the family farm. At 31, after his father’s death, he entered the Capuchin Franciscan Friars, and was given the name Conrad. 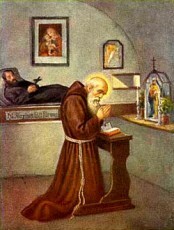 After his profession, he was sent to the Friary of St. Ann in Altotting. The friary served the Shrine of Our Lady of Altotting, the national Shrine of the Blessed Mother in Bavaria. It was here that St. Conrad was given the position of porter at the Shrine, and he retained it until his death. Because of the size of this city, and the many pilgrims, the duty of a friary porter was a difficult one. Conrad was known to be diligent at his work, sparing in words, bountiful to the poor, and eager to help strangers. He served in this position to the town’s people for forty years, fulfilling their needs of body and soul. St. Conrad loved silence in a special way, and his spare moments during the day were spent in a nook near the door, where it was possible for him to see and adore the Blessed Sacrament. He was known for depriving himself of sleep, to spend time with Jesus in the Church or Oratory in prayer. It was the general belief of his fellow friars, that he never slept, but continually occupied himself in his duties and devotion. On April 21, 1894, St. Conrad died in the friary where he had served for 41 years. During his lifetime, Brother Conrad was known to have the gift and ability to read the hearts of those he met, and was attributed with the gift of prophecy. His heroic virtues and the miracles her performed won for him canonization by Pope Pius XI in 1934. St. Conrad was born John, in Bavaria, now modern day Germany. He was the ninth son of a farming family, and after loosing his parents, entered the Capuchin Friars. He was sent to the National Shrine of the Blessed Virgin Mary, and took the position of Porter. He had the ability to work miracles, and was able to read the hearts of those he met, as well as the gift of prophecy. He was believed by his fellow Brothers, to never have slept, rather spent his time with his duties or in devotion at the Chapel. He practiced heroic virtues that won for him the title of saint, and was canonized in 1934 by Pope Pius XI.